Publishing a new book using Amazon Direct Publishing (KDP) is an exciting time for any new author. There are so many things you have to do, and it is sometimes easy to overlook a few important things. When you publish different versions of your book, such as in Kindle ebook and paperback, you should always check your book sales page. It is not unusual for Amazon to take quite some time on occasions to combine both versions. But when you have separate sales pages, it is difficult for potential readers to find your book in their preferred format. Another problem is that because you have two separate book sales pages with different URLs, it makes it impossible for you to promote your book with one link. So it is a priority for you to check that all versions of your book are linked and appearing on only one Amazon book sales page. When you publish a new version of your book, wait seventy-two hours and then check your Amazon sales page. You should see all your book versions listed on one page with the relative selling prices in a series of boxes. If you see only one version, such as in the images below, you will need to take action to combine your books. You will need to contact Amazon to ask for your book pages to be merged and link your print and Kindle editions together. If you are new to Kindle Direct Publishing (KDP), it is not so obvious how to contact KDP to help you. 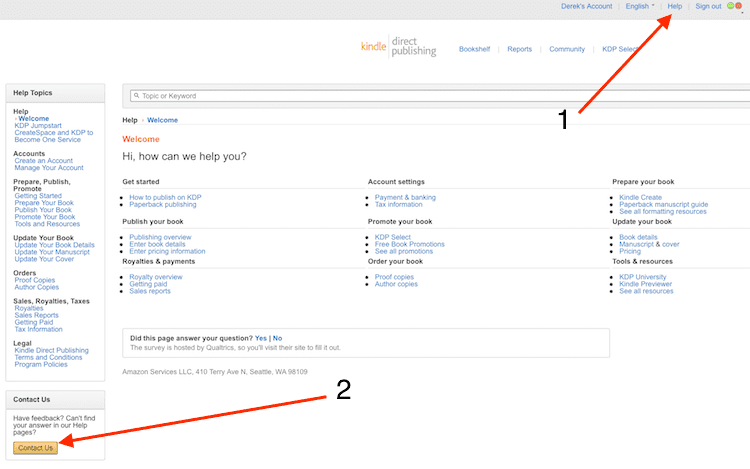 Go to your KDP dashboard and click the Help link in the top right menu. The new page lists all the help topics, but the contact link is at the bottom on the left and is not visible until you scroll all the way down to the very bottom of the page. 1. Click Help. 2. Click Contact Us. When you click Contact Us, a new page appears with a list of choices. Click the Amazon Product Page button. Now click on Linking Print and Kindle Editions. 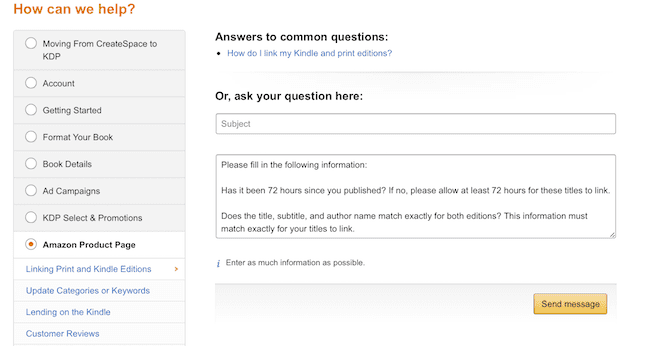 You will then see the contact form to complete to ask Amazon to link your print and Kindle ebooks. You will see in the message prompt that Amazon asks you if your two book version titles, sub-titles and author name are exactly the same. Before you send your request, double check to make sure that you didn’t make any accidental changes or typos in your title or sub-title between versions. If there are any differences or discrepancies between your book versions, you will have to re-publish the version that is not correct. If you are sure both versions are exactly the same, then you can proceed with your message to Amazon. In your message, make sure you include your book title, author name, ISBN and ASIN numbers. You can include the URL links to your separated pages if you wish. It is a good idea because it makes sure Amazon knows which pages to combine. Once you send your request, Amazon usually completes merging your book editions into one page within 72 hours. Once your pages are successfully merged, you can then start to promote your book with one Amazon URL book page link. It also might be a good time to check your Amazon Author Page on Amazon Central and update any information you think will improve your book’s chances of success. You can add your blog feed, enhance your book description and add editorial reviews. Yes, you can add book reviews! You can also set up new author pages on Amazon UK, Germany, France and Japan to promote yourself internationally. You can read our short tutorial on How to use your Amazon Author Page for more details. 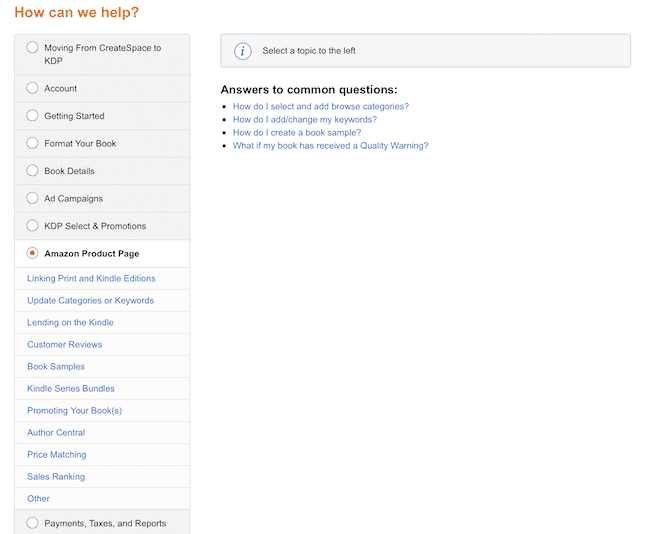 You can create Author Central book pages for Amazon US, Amazon UK, Germany, France and Japan. Another positive action you can take at this time is to check your book’s categories and keywords. Very often, in the rush and panic of publishing your book, you may have failed to research your competitive genre categories and seven searchable keywords. If you are not sure how to do this, you can refer to our article explaining how to find KDP keywords for your book. There are also certain keywords that Amazon uses to create new genre categories. You can find out how to do this in another of our KDP keyword articles about how to master keywords. If you complete everything in this article, you will give your book a big boost and improve its chances of success.